The Schuberth C3 is light, quiet and comfortable. 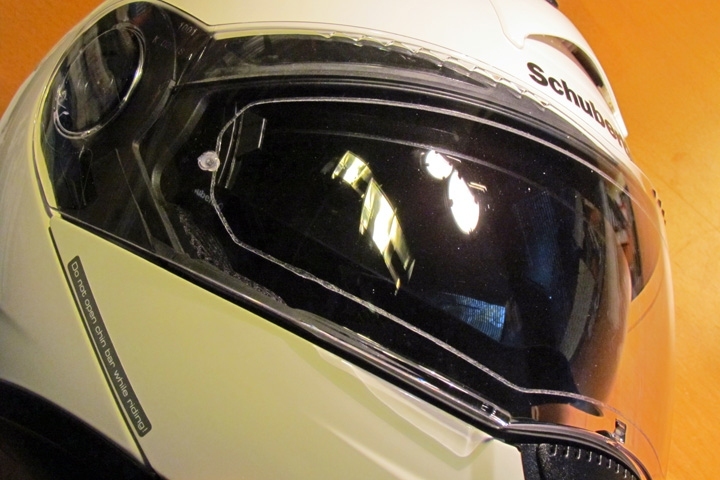 German-made Schuberth helmets have had an on-again, off-again affair in North America. This has finally been resolved with California-based Schuberth North America, a satellite office of Schuberth GmbH. Schuberth was the first company to offer a flip-up full face helmet; I got my hands on the latest iteration of this design, the C3. Schuberth claims the C3 is the lightest flip-up helmet on the market (1,650 grams), and weight-wise it fits right in the middle of the full face helmets in my collection, which includes brands like Arai and Shoei among others. The maker also claims it’s the quietest flip-up on the market (84 dB @ 96 km/h). It is, in fact, the quietest helmet I’ve worn recently, and that’s partly due to the helmet’s aerodynamics, but also because the helmet fits very snugly around the rider’s neck, reducing wind flow inside the helmet, and subsequently the noise it creates. This can cause a lot of heat to build up inside the helmet in hot weather, but there are two ways to combat this. One is to open the easily accessible vents — one in the mouthpiece, one atop the helmet — which allows a remarkable amount of air into the helmet, especially over the top of your head. The literature claims seven litres of air moves through the helmet at 96 km/h (60 mph). The wind cuff is easily removable to allow more airflow in hot weather. The other is to remove the wind cuff beneath the chin piece, which is held on by Velcro. Removing the cuff increases the noise level a bit, but the helmet still remains remarkably quiet. The helmet comes with a fog proof pinlock visor that installs inside the main visor. The pinlock visor is pre-installed at the factory and it works as claimed (hot air being expelled by my substantially sized snout during a ride on a cool morning proved its effectiveness), but it also creates some annoying reflections at night. The fix for this was easy, I just removed the pinlock visor, though it left a sticky residue in the form of its outline on the visor. The pinlock visor can be reinstalled if needed. 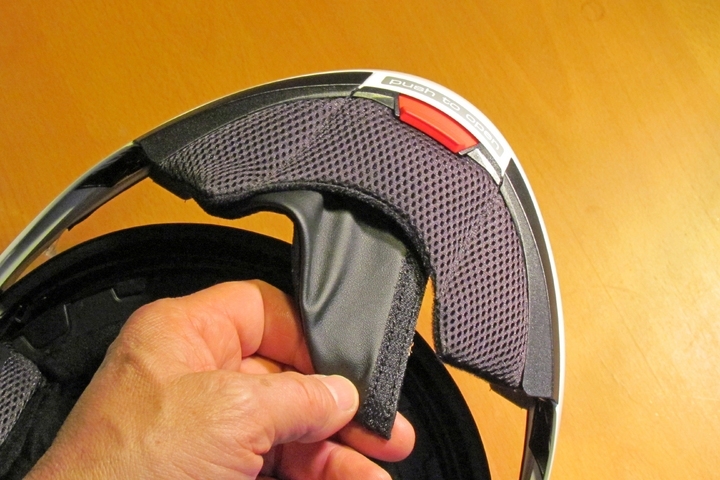 The main visor is mounted with quick-release latches and comes off in a jiffy. The flip-up feature is convenient when riding around parking lots or stopped at a traffic light (you’re not supposed to ride with the helmet open), allowing you to breathe freely while improving peripheral vision, though you’ll be doing without eye protection while the helmet is open (unless you wear sun or prescription glasses). The only issue I had with the flip-up section was that it wouldn’t snap shut just by pushing down on it, but once I was shown how to snap it shut by grasping it between the visor opening and helmet shell with one hand and squeezing, it was a snap (pun intended). Removal of the anti-fog visor left a thin outline on the main visor. We’ve since been informed this was only on early production models. Now, you won’t need sunglasses because the helmet has one more convenient feature tucked into its shell: a retractable sun visor. An easily accessible lever on the lower left side of the helmet raises and lowers the sun visor, and it can be left in any position between full up and full down. This is a very handy feature and once you become accustomed to it, you wonder why more helmets don’t incorporate it (to hell with swapping visors, I say!). The C3 fits my head snugly and comfortably, with no unpleasant pressure points revealing themselves after several uses. It even has sufficient space up front for my formidable facial feature, which isn’t always the case. It also has a removable, hand-washable liner. 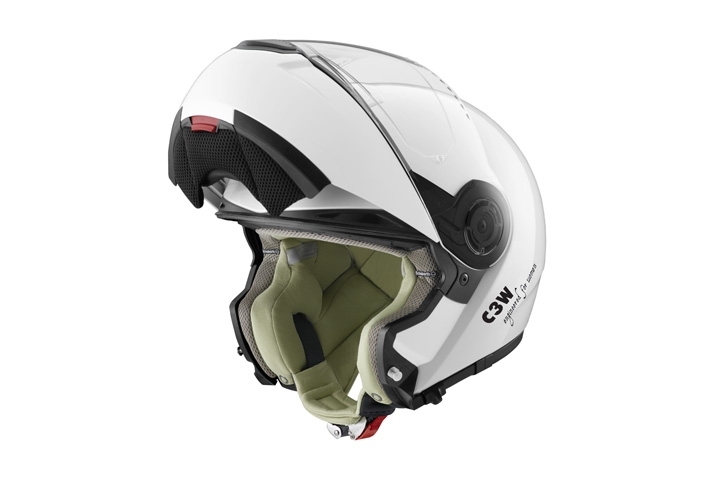 The C3 is also ready to accept the optional Schuberth Rider Communication System made by Cardo that has Bluetooth capability, MP3 connectivity and an intercom function. It will also accept BMW’s communication system without modification. Schuberth also offers the C3W, which has all of the features of the C3 but has redesigned cheek pads with slow memory foam to better fit women, and a Jersey-knit microfiber that makes it easier to clean off makeup from the liner. The Schuberth C3 is ECE 22.05 and DOT approved. DOT approval for North America required that a layer of Dyneema be added to the inside of the fibreglass shell upon construction to resist the DOT’s penetration test. The C3W has an inner liner specially designed for women. Another safety feature is Schuberth’s anti-roll-off system. This system attaches the chinstrap, via two other straps, to the rear of the helmet shell, preventing the helmet from pivoting forward and possibly off a rider’s head in a crash. The Schuberth C3 (and C3W) doesn’t come cheap, retailing for $800, but if you do spend that kind of cash on this kind of lid, you’re getting a premium product full of unique safety and convenience features, and included in the price is Schuberth’s Mobility Program. Under the program the manufacturer will replace a helmet damaged in a crash within one year of the initial purchase for one-third of the retail price. I definitely think you’re getting your money’s worth. Schuberth helmets are currently distributed in Canada through Moto Internationale, Rider’s Choice and Blackfoot Motorcycles. Very helpful suggestions – thanks folks. This D-ring type replacement clasp is available from many vendors. Bought one, myself, the night after making that last post. The chin strap is no issue for me, though I have to tighten it to the final point for a proper fit. Seems a far better fit than my Shoei Multitech, though with subjectively less airflow. The inner tinted visor works quite well and I look forward to using this helmet, this summer. I tried the Schuberth C3 and loved it except for the chin strap buckle which made it a non-starter for me. Do you know how the traditional D ring fastener was made to fit the Schuberth? Good to hear. I’m still hoping for the day that someone makes a Snell Certified flip, that doesn’t weigh 10 Kg. 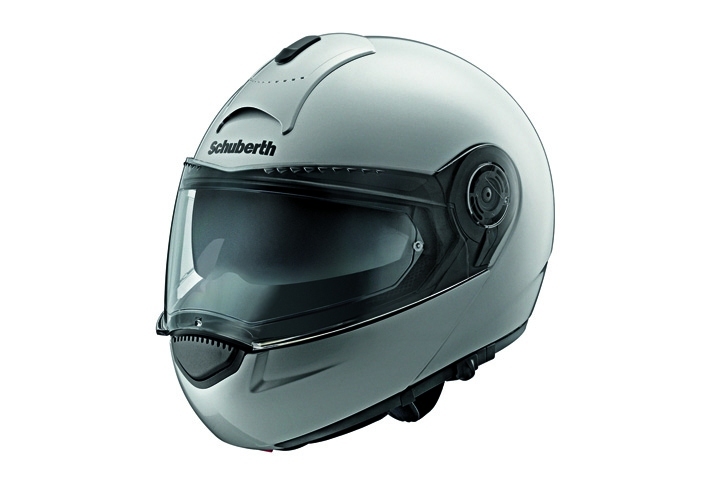 Rob, the Schuberth uses stainless steel locking pins for the chin piece, they look quite solid. Costa, did you notice if the chin locks were metal or (as is much more common) plastic? That has been my main sticking point with most flip-ups; that the chin piece was held on with something no more solid than a zip-tie. My current Shoei flip-up uses metal, but less sturdy than I would prefer. 2) because it jammed my adams apple, I cut off the huge chin strap clasp and replaced it with a much smaller aftermarket quick connect clasp.